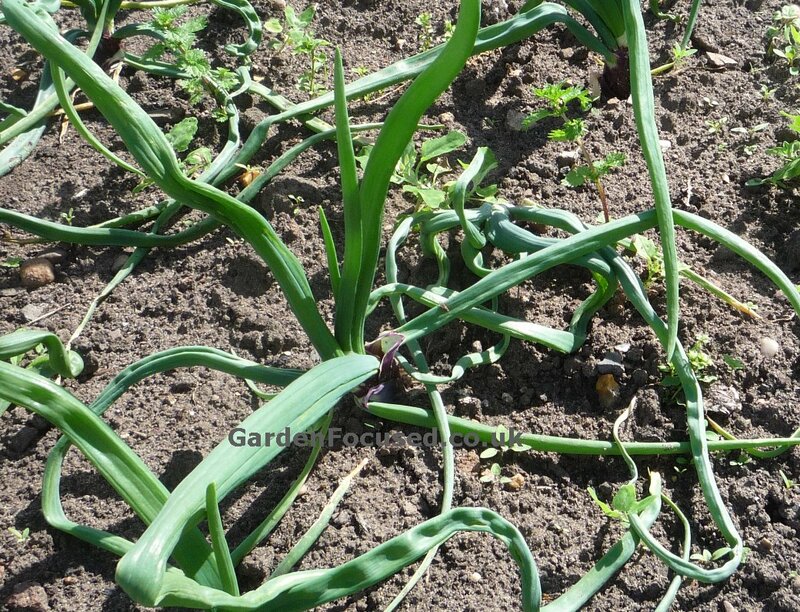 Onions are a reasonably healthy vegetable crop in most cases but when they do succumb to a pest or disease it is often serious and can be difficult to eradicate from the soil for several years. Crop rotation is absolutely essential for growing a healthy onion crop. A second key essential is to remove all traces of the onion crop from the soil after harvest. If any are left in the ground they are liable to infection over the winter. MOST DISEASE RESISTANCE - SETS OR SEEDS? One common discussion point amongst gardeners is whether onions grown from sets or seeds are more prone to this or that disease. 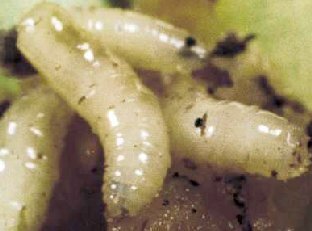 In 2014 eelworm was a major problem with many gardeners reporting that either sets or seed grown onions were better or worse. There is no common consensus in reality other than the fact that buying onion sets from a reputable supplier is essential for avoiding pests and diseases. In all likelihood the variety of onion has a far larger influence on disease and pest resistance compared to growing from set or seed. But fact-based research into the pest and disease resistance of various onion varieties is in its infancy and very hard to find. This erudite article produced by researchers goes into great detail about Fusarium Basal Rot, one of the plagues for onion growers, but fails to come up with a comparison by variety, it's all about what may happen in the future. The only research we can find which comes up with solid facts about a few different varieties is from the Agriculture and Horticulture Development Board. But even that article is very limited as far as facts go which might be useful to the average gardener. All we could gather from it is that red coloured onions have a lower yield and slightly shorter storage life compared to brown coloured onions. Storage life is an important factor overlooked by the average gardener although almost all want their onions to March or April the next year. Storage life is most definitely dependant on the variety chosen. To take this point to absurdity, Japanese onions have a storage life of a matter of weeks whereas some maincrop brown skinned onions have a storage life in excess of six months. But here's the "fly" (pun intended!) in the ointment for onion storage. According to the Agriculture and Horticulture Development Board research mentioned above, the onion variety Red Baron (very common commercially and for amateur gardeners) is both the best and the worst of all the onions tested as far as storage is concerned. Red Baron onion sets from the English Set Company, stored until March the next year, have a survival rate of 74% but the same variety from Broer / Elsoms have an appalling survival rate of only 27%. 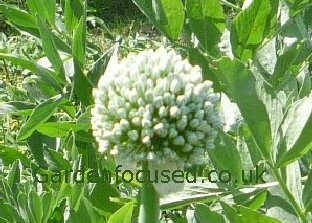 What we advise, from all the research to date, is to grow an onion variety which is to your liking (seed or set, whichever suits you), works well in your garden / allotment and ignore all the advice you receive from other sources. If you like them and they work for you then stick to your guns. Now we'll get to the real point of this article, a list of common onion pests and diseases, how to identify them and how you can prevent and / or treat them if things go wrong. The first thing you will notice is that one of the central leaves will begin to form a capsule at the top end of it. This will quickly emerge as a flower. The flower head will then die off revealing the onion seeds. Even though the plants has ..... Click here to go to the full article about bolting onions. The first signs become visible on younger developing onions. The leaves wilt and turn brown, these symptoms also then occur on more mature plants. The top of the bulb may smell slightly and will begin to rot. Maggots may well be visible in it. Gardener's sometimes confuse onion fly with white rot because the above ground ..... Click here to go to the full article about onion fly. 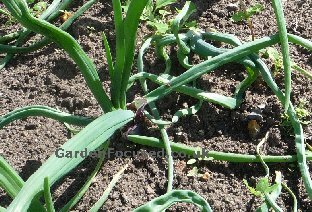 The Allium Leaf Miner attacks leeks, onions (almost exclusively spring sown / planted ones), shallots and other members of the onion family. The first problem you will probably notice is that the leaves becomes distorted and don't grow in the normal straight and upwards manner, some leaves will lie on the ground. If you look ..... Click here to go to the full article about Allium Leaf Miner. Dig an infected onion up and you will see it looks rotten and feels soft to the touch. White and powdery mould will have formed on the base of the onion with black spots in advanced cases. 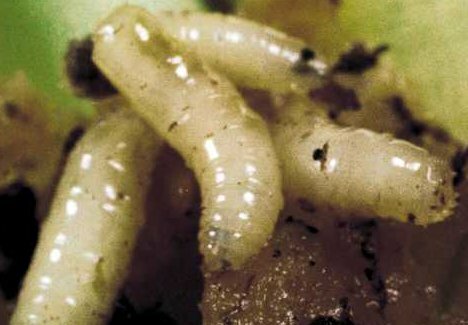 There will be no signs of grubs or pupae (unless as a secondary infection) because this is a fungal disease (Sclerotium cepivorum) and not ..... Click here to go to the full article about Allium White Rot. The damage will almost certainly not be visible until the onions have been in storage for a couple of weeks. At first the top part of the bulb will turn browner and the skin will be darker brown. If you gently push the top of the bulb at this stage it will be softer than the lower parts. Mould will then ..... Click here to go to the full article about Onion Neck Rot. Often simply called Leek Rust, it affects onions, leeks, garlic and chives. 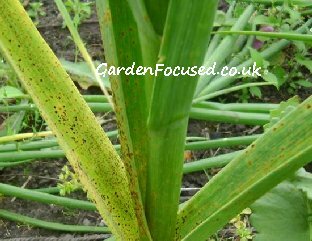 Rust is a fungal disease which attacks the allium family of plants the worst affected being leeks, onions and chives but onions are also sometimes affected. The Latin name for the fungus is Puccinia allii and it first makes an appearance in mid to late June time. It thrives in areas of ..... Click here to go to the full article about Allium Rust. Got onion fly in my big kelsies. They were coming along a treat, what to do with them now? ANSWER: There are no pesticides or treatments for onion fly. Prevention of this happening again next year is your only course of action. Click here for our article on onion fly. A very comprehensive explanation of how to grow onion sets. Doesn't leave any more questions to be asked!